CityKin: Happy Pesach (Passover) ! Whether you're celebrating a Seder, or The Last Supper, or just gathering with friends, all of us here at CityKin wish a blessing upon your house during this sacred time. Is Judas the bald one? This scene mimics DaVinci's Last Supper. In the orignal, Judas Iscariot appears 3rd to Jesus' right, shown in shadow, looking rather withdrawn and taken aback by the sudden revelation of his plan. 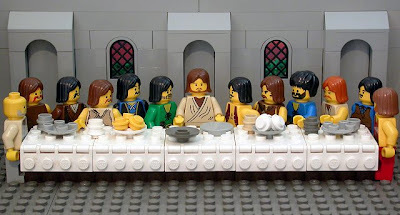 He clutches a small bag (not shown in the Lego version), perhaps signifying the silver given to him as payment to betray Jesus, or perhaps a reference to his role within the 12 disciples as treasurer. He is the only person to have his elbow on the table; traditionally a sign of bad manners.